I've got compost on the brain these days. I even have a picture of it as my wallpaper on my iPhone. It doesn't help that this company is taking the city by storm. A drive around town on pickup day finds many homes with their buckets out on the curb, waiting for pick up and these trucks scurrying about the city to do so. In general, here, we do not outsource our compost. We make our own. Given the reality of our situation here, there is no curb-to-compost bucket big enough for our chicken bedding and manure, yard waste, and kitchen waste. We would need a dumpster, which does not seem very curbside chic to me. But, shhh. Let me tell you a secret. We needed to do something this spring. We did indeed need to order a delivery of compost. I know! The horror. There it sits close to curbside, in front of the woodpile from the fall that never quite got stacked. This woodpile was easy to ignore under the feet of snow during the winter, but now, there it sits. Awaiting attention. But first, I must spread the compost. I tried Hermione's foolproof accio spreadare enchantment. Yet, inexplicably, this purchased pile did not seem to want to distribute itself evenly about the fruit patch. Why, you may ask, if we are avid composters, did we need to buy some? Well. I will tell you another secret. Because apparently we are idiots. We do a good job creating and collecting compost ingredients. But not so much with the whole compost cooking part. When I began digging around in our compost bins early this spring, I found our compost looking remarkably similar to what it had looked like when I hauled it down there from the kitchen. Having survived the winter, frozen and then thawed again, it seemed none the worse for wear. Quite disappointing. And, even worse, I found myself envisioning the chicken manure-related ways we would likely kill friends to whom we passed our seemingly delicious homegrown vegetables. Perhaps it is the fault of the city's offered containers, that do not realistically allow us to stir the pile. Nor do they actually keep out animals. Or perhaps, and more likely an explanation, it is because I had kind of neglected the whole layer the brown and green thang. And so, we decided that we needed to get serious about our composting. Books were interlibrary loaned. And old favorites we already had, but had neglected to consult, were referenced. And following the instructions in these books and after watching a few YouTube videos, a new compost receptacle was built. And while Jonathan built, I layered. Carefully following instructions this time. I am working on local grain and natural chicken forage for our flock here. 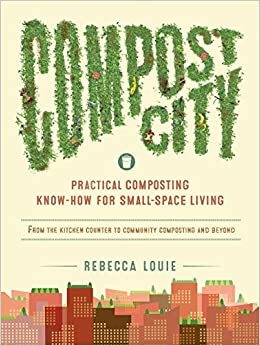 I have read about the Vermont Compost Company's system for compost development, particularly the relationship between their chickens and their compost, and I am intrigued. Any way we can pass the work of turning and stirring and moving the composting process along while also providing healthy (free) nutrients for our chickens sounds good to me. We attached front panels to the bins that are removable with eye hooks, so that I, or our chickens, can get in there and stir things up. The ladies seem compost curious. And so, I was thinking I would order some worms, you know, because I had read that worms are hearty composters, and how good their castings and waste can be for your gardens. So I did a bit of online searching, thinking I would order myself a batch of worms by mail. I was entertaining myself with the idea of mail delivery day, and how Elliott has been so disappointed that no chicks and no bees have arrived by mail this spring. I would give him worms! And allow him to set those little wigglers loose in the bins. And then, I realized. Well, actually, I read more. You can't put worms in a cooking compost pile. Because you would cook the worms. Silly me. And so, I put compost starter in instead. It's less exciting than a box of worms. But no one is going to die here. I did indeed quote Last of the Mohicans as I did so: Just stay alive, microbes! (Ah, compost humor.) Though admittedly not as catchy as the original quote, but neither is other compost related vocabulary, such as silage, inoculum, and windrows. Since we know watched pots do not boil, and attempting to move us from the noun form of compost to the verb form (a little more compost humor for ya), I am busying myself with store boughten compost spreading. And now, these are headed to the curb. Empty, compost free, for someone else to see if they can follow instructions better.